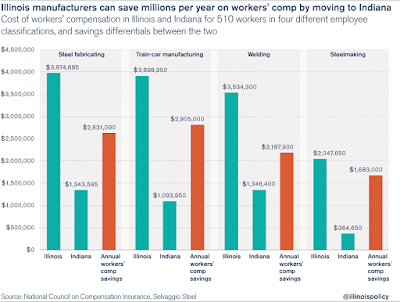 Manufacturers in Illinois have had it with tax hikes after tax hikes coupled with the most costly workers' compensation setup in the nation. And businesses are voting with their feet. In July, five firms left Illinois for good. The Illinois legislature is to blame. Pro-union Democrats have been in control of Illinois for decades. Mike Madigan has been House Speaker every year but two since 1983. Chicago Magazine labeled Madigan "Velvet Hammer" and the Real Governor of Illinois. Today, Hoist Lifttruck threw in the towel on Illinois. Interestingly, the company is located right across the street from Madigan's district. The Illinois Policy Institute reports Manufacturer Moves Out of Madigan’s Backyard, Cites Unfriendly Business Climate. In fact, Flaska decided to self-insure after paying millions to settle dubious workers’ compensation claims out of court. Common-sense reforms establishing clear standards within Illinois’ workers’ compensation system and freezing the nation’s second-highest property taxes are on the bargaining table in Springfield. Gov. Bruce Rauner has placed them there for a reason – Illinois must stop its exodus of people and businesses if the state is to forge a stable fiscal future. In addition to six manufacturers totally leaving the state, Motorola Mobility to cut 500 jobs in Chicago. And just yesterday, Kraft Heinz Announced 700 Job Cuts at Their Illinois Headquarters. Link if video does not play: Get Me The Hell Out of Here.